The first baby stroller we got for Kyle was the Stokke Xplory, and after four years, we’re now using it for Kurt. I fell in love with it the first time we saw it in Mothercare BGC. Stokke is known for making products that are beautiful and versatile. From the photos, you can see that it looks really modern and stylish, which is what first attracted me to it. 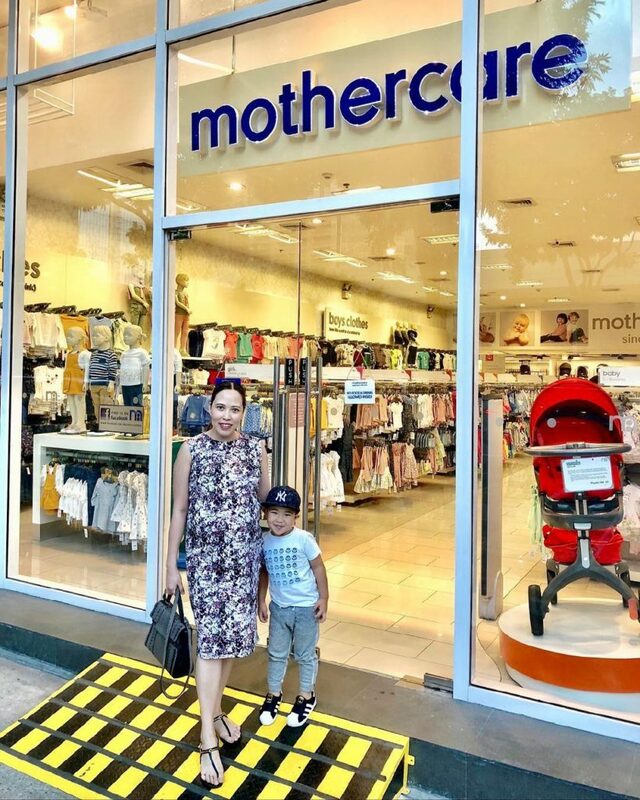 When the staff happily showed me all its features and how functional it is, I was even more convinced that it was the right stroller to buy for Kyle. 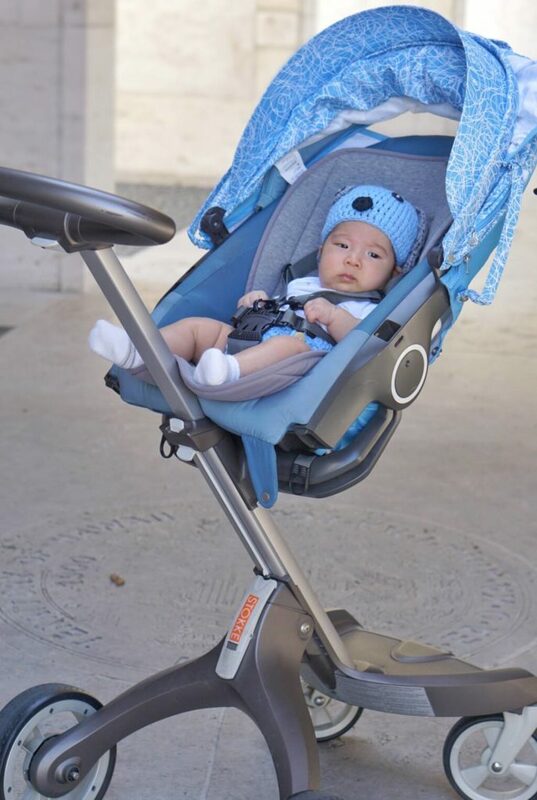 The seat is higher than other regular strollers, and that makes it easier to check your baby and reach him or her. You have the option to adjust the seat making it front-facing or rear-facing, too (double thumbs up for me!). For newborns, it’s configured to face the parent, which I absolutely love. The height and configuration are also adjustable – I started with a lying-down setup and eventually made the seat more upright when Kyle can already sit and look around him. Although the Xplory is larger and bulkier than other strollers, I feel much more secure when using it because it’s really solidly built. 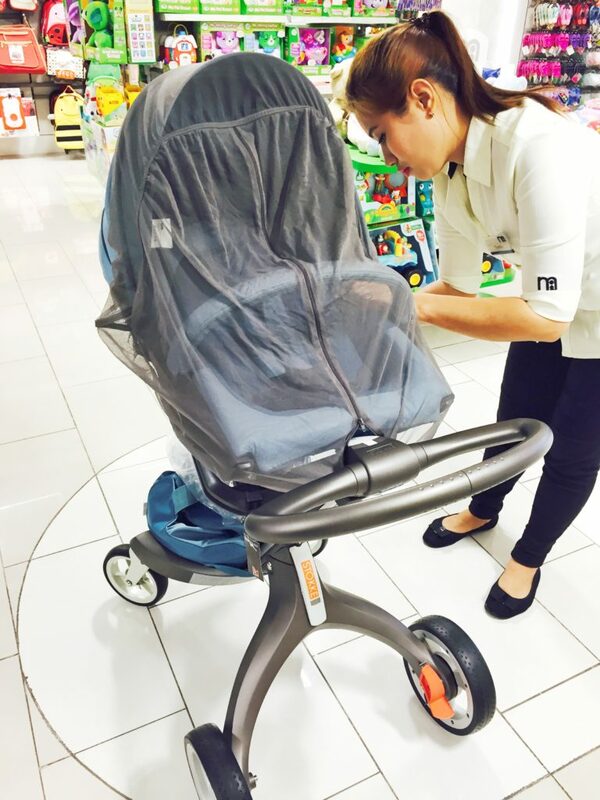 It feels different from regular strollers – even as the one pushing, I can feel that the ride is more comfortable for my baby. It’s ideal for parents who love to walk their babies around – bringing them to a nearby park or even to the grocery. The Xplory moves smoothly even on rough or uneven surfaces such as parking lots or sidewalks. Another great benefit of the Xplory is that you can bond with your baby more while walking because the height of the seat makes the baby closer to you. Walking with Kyle in the Xplory is one of my favorite bonding moments with him. Sometimes I would just use one hand and walk on the side, making him feel closer to me as we wander. Another bonus, it’s a perfect companion for changing diapers on the go -– perfect for OC mommies. And oh, it’s a great alternative for feeding, too! You can set it up as a high chair and you won’t need to request one and move your baby out of the stroller at restaurants. The only downside I see about the Xplory is that it’s not easy to use when traveling because of its size. 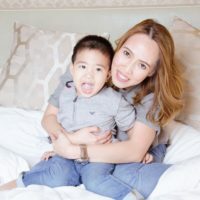 I use a different stroller when we need to travel – I discovered the Baby Zen stroller in one of my travel, even before it was introduced here in the Philippines. I’ll try to share about it in a later post. The Stokke Xplory we first bought four years ago; outside Mothercare BGC with Kyle, the day we bought the new Stokke Summer Collection accessories for Kurt. I think the Xplory is great not just for parents, but for the babies as well. They see more things because they’re seated higher, and they’re also closer to you. It almost feels like they’re walking beside you, and I get to talk to my baby as we walk. And interestingly, the Xplory, despite its size, is easy to push even with just one hand. The other thing about the Xplory is that people notice whenever we use it outside. They’ll ask where we got the stroller and they find it really unique. Interestingly, after we bought the stroller and started using it, we found out that it’s the stroller many Hollywood celebrities use. O diba? The quality of the Xplory is really good, and even when Kyle outgrew it, I knew I will keep it for the second baby. Sobra syang gamit sa amin (we really used it a lot), but it’s really, really durable. We had another stroller we use for traveling, which broke and was replaced by the Baby Zen stroller. 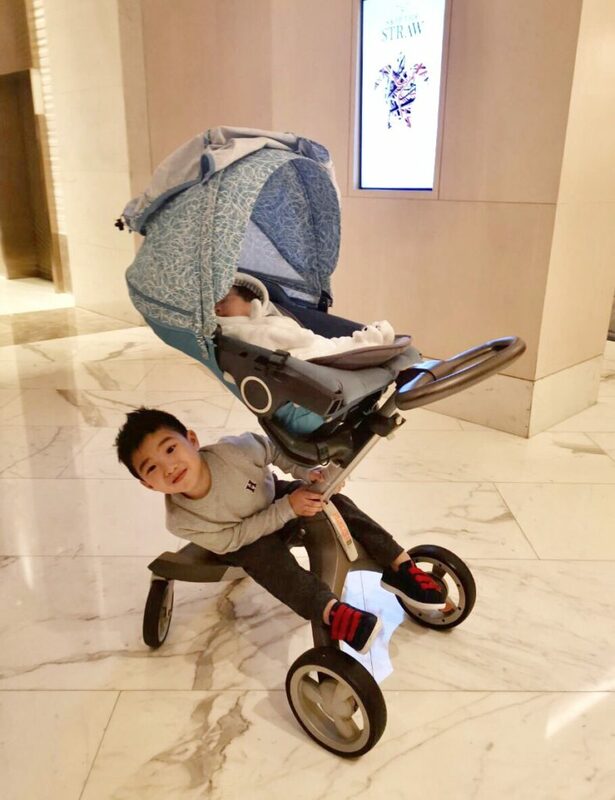 But the Xplory is our first stroller and I’m glad it’s still going strong with baby Kurt – in fact, it still feels like new! Luckily, after 4 years, Stokke came up with a very good idea to develop more accessories for the Xplory. This makes mommies like me super happy! I was given the option to change the look for Kurt – they now have more whimsical designs for the fabric. I got the new summer collection before Kurt was born. Our Xplory now looks like a new stroller because of the different pattern, but it’s actually the same frame from four years ago. The new accessory has an added feature – a hood with attached visor to protect the baby from direct sunlight. The fabrics also come with UPF +50 protection to keep your baby cool even in warm temperatures. In the end, I saved money because I didn’t have to buy a new stroller for my newborn. Eventually, we may need to get another stroller for traveling with Kurt. For now, though, Kyle’s old Xplory is what we use. 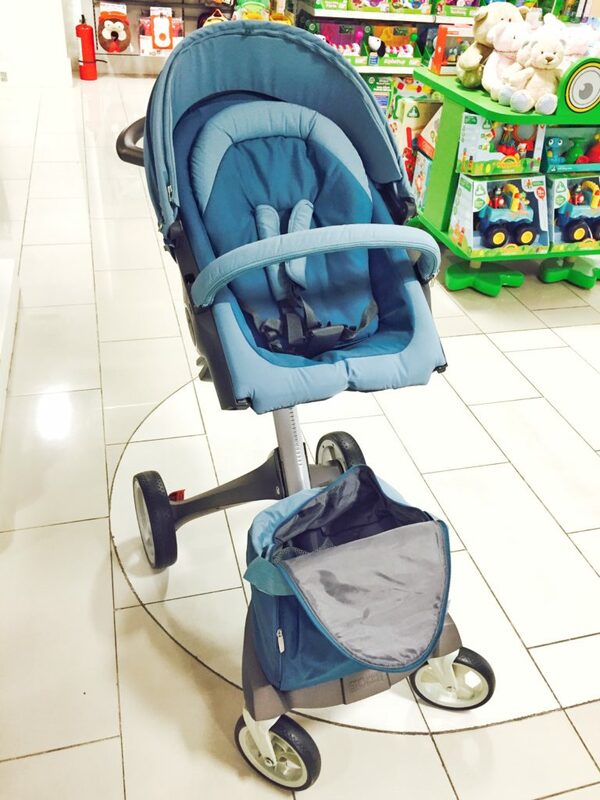 The Stokke Xplory is pricier than other strollers and but I don’t regret buying it. It gave me a lot of good memories with Kyle, and now with Kurt. I’m looking forward to having more time to bond with Kurt as he rides the Xplory. And if I were asked whether it is worth it, it might not be sulit (good value for money) for other people because of the hefty price tag, but I feel that it’s really a worthwhile investment for my family. Kurt starting to sit up in his Stokke Xplory; Kyle having fun while his brother sleeps soundly above him; me bonding with baby Kurt in the park.